Ask any prepper what they consider to be their foundational piece of kit and they’ll almost always say their BOB or Go-Bag. Sure, a few switched-on mindset-focused types will answer “my brain,” and they aren’t wrong, but I am speaking specifically about equipment, not wetware. The BOB is the cornerstone of most preppers’ planning and organization because it enables survival across a wider variety of domains and situations than just the clothes on one’s back. A packed bug out bag at the ready or close at hand means your chances of enduring a sticky situation just went up. The BOB contains implements to cover all requirements necessary to life in a crisis, and assures you’ll have shelter, food, water, light, security and more when you need it. Wherever you can park yourself and access the blessed BOB’s contents, you are home. With so much necessary equipment in one piece of luggage, it begs the question: what will happen should you lose it, or be forced to ditch it to accomplish some necessary task? How well will you fare with just your wits and whatever is in your pockets, if anything? Do you have all your eggs in one basket when it comes to your equipment? Should you take precautions to make recovery of your bag easier? If you have not done so already, it is high time you consider what you’ll do in the event you are temporarily or permanently separated from your BOB, and some procedures to minimize the loss. More than a few preppers will, in response to the question I just proposed, confidently, dare I say arrogantly assert that they are veteran bushcrafters, outdoorsman of the highest order, born again pioneers, and they can positively absolutely live off the land with nothing more than their trusty knife, and maybe not even that. A very rare one or two of them may even be right. These most rugged of survivors can probably craft a small cabin in a few days time, harvest enough wild game to sustain them for the winter and treat any ailments or vitamin deficiencies with natural supplements from wild plants, roots and so forth. When spring approaches, he will emerge well-fed and hardy with a fine longbow and supply of arrows. The problem for the rest of us is that, lacking the convenience, certainty and labor-saving perks of modern gear, you’ll be expending drastically more energy, and time to accomplish the same things, and lacking significant practice and experience, may not be able to perform vital tasks without purpose-made tools. You should absolutely be practicing primitive skills and austere conditions survival, no doubt. But the assertion that one will be “fine” in the wild when SHTF with no or minimal gear is a boast that most absolutely cannot live up to. The difficulty and effort required to be truly self-sufficient in nearly any climate means even a minor curveball or injury can have fatal consequences. If you need a fire right now, it is a small matter to gather suitable fuel, place your tinder and strike a match or lighter. A little harder but still simple is doing the same but sparking a fire steel. Lastly, you can start a fire through friction, using a primitive technique of your choice, but you’ll be sweating like a man condemned and possibly shivering while you do it. Same thing with shelter; you could gather or cut down saplings and branches, same with leaves, boughs and so on, and whip up a small shelter to help trap some of your newly created heat, but this will be at least an hour in the making. Compare that to just setting up a flyweight tent or even a simple reflective blanket that would let you both get warm, and get recuperative rest faster with less stress than either of the mentioned old-school survival methods. I’m in no way arguing against learning and practicing those skills. You should be! But when survival is on the line, modern equipment is far from some cushy luxury; the efficiency and ease it affords may be the difference between life and death. You took the time to set yourself up for success, after all. All of the above and more is the reason you must not treat the loss or potential loss of your BOB as anything short of disastrous. Sure, you might have caches here and there that you can resupply from, and bravo to you for being that far ahead of the power curve, but if you have some ways to go in order to get to them, especially through an environment made hostile by man or nature, you may never reach it. So with all that said, what should you do to minimize the chances that you’ll lose your bag and all of the life-saving gear it contains? BOBs and other gear could go missing or get destroyed in all kinds of ways. This could happen before, during or after the onset of a crisis. Whatever happens to it, your BOB will either be recoverable or non-recoverable. If you can do so safely, you should make every effort to get it back. If you cannot, you must weigh the risks of giving up essential gear against risk of harm or death. Prior to an event, your BOB could go missing if stolen from your home or vehicle. The onset of disasters like a wildfire, flood or other weather event could see your BOB destroyed before you get to it, or made inaccessible due to a collapsed structure or crunched car. The latter instance may mean it is recoverable. During the aftermath, you may be shaken down for supplies and food by desperate survivors or outright brigands. A carjack type scenario may see you lose your transportation and everything in it. Chances are you will not be able to recover a BOB taken from you by force without risking death. When camped or otherwise resting a sneaky burglar might make off with your BOB and more without resorting to violence, still leaving you high and dry. Attempting to track them is an entirely different topic. Depending on their head start, it might be impossible. Simply losing your pack is always a possibility, either in the dark, or from strap failure that may dump your pack and contents into an inaccessible place. Things happen. The bad guys get a vote. Mr. Murphy comes a calling. If you are careful, quick and use good gear, it might not ever happen. Best to have a plan in case it does. If you are mugged for your bag, will you risk a lethal confrontation to protect it? If it is snatched, will you pursue? How much effort, time and risk are you willing to put in to recover a lost or inaccessible bag? Think about these scenarios before they occur. Levels of equipment meaning locating some of your kit on your body either in pockets, on the belt, or in a chest rig, thigh pouch, or other “subload” on the thigh. This concept is handily borrowed from the military concept of 1st, 2nd and 3rd line gear, with higher levels of gear equating to a greater load and also greater capability, usually oriented toward sustainment. This concept is great when practiced as a rule because it ensures that, barring you are stripped or have your clothes torn open in a brawl with a bear or errant cactus patch, you’ll have the most basic necessities on your person, hopefully enough to allow you to survive until you can resupply or recover your BOB. For starters, consider your pockets and belt line. 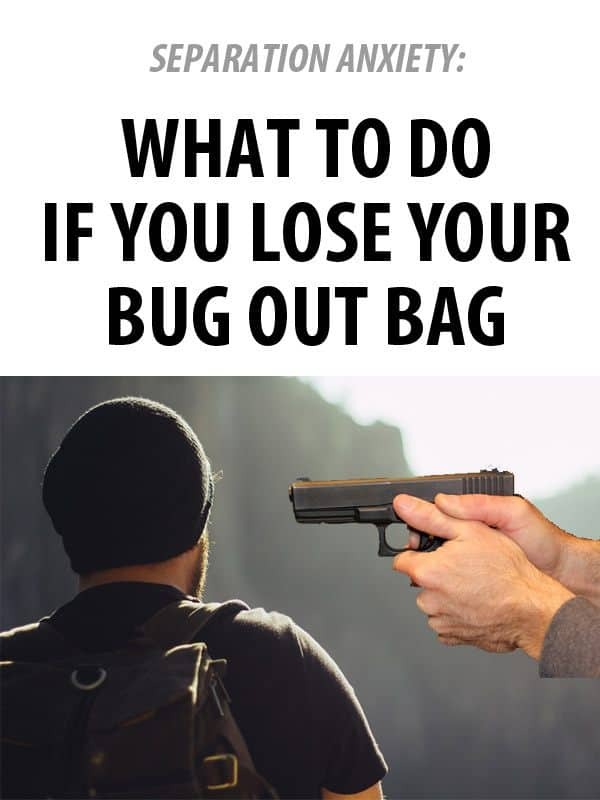 Between these locations you can easily carry or store a pistol, spare magazine, multitool, flashlight, knife, basic first aid kit, fire-making tool, a food item like an energy gel shot or nutrition bar, tiny compass and a little more. Those items will keep you safe and warm, provide calories, banish darkness and let you process what you need to create shelter, even if it is rough going with just a knife and multitool. Your next level, on a chest rig, thigh pouch or smaller, supplementary bag, would hold items geared towards making your life a little easier and enabling you to survive a little longer. Things like a proper fire-starting kit, water purification item, maps, additional “nice-to-have” medical items like meds and additional bandages or gauze, a few more ration items including electrolyte powder, gloves if you aren’t wearing them, a headlamp, spare batteries, tarp and space blanket, and folding saw or light hatchet. You’ll notice that these items supplement what you are already carrying and expand your capabilities. If you had what was in your pockets and subload and nothing else, you would not be doing too badly at all. A word of warning: some of you who have not until this point considered any additional load carriage solutions may be feeling mildly giddy with potential by now: you can bring all those extra things you were forced to leave out of the pack itself! Not so fast; remember that ounces make pounds and pounds make pain. You must, must, must justify everything you bring against a weight budget, and ergo your energy budget. Moving more weight burns more calories and incurs greater fatigue, fatigue that adds up. Consider what you decide to include carefully. Now let’s add your main pack, the BOB itself. Within it you will keep your primary water supply, shelter, additional food, weapons or ammo, tools, hygiene and mess kit, camping stove and fuel, full medical or trauma kit, additional clothes and insulation appropriate to the climate and season. Notice again how we are essentially climbing a ladder of sorts when it comes to equipage and capability. That is by design. Please note that the list of items is not comprehensive, and everyone has their own idea of what fits where. Some folks will not consider parting with a canteen or water bottle holder on the beltline or a water bladder on their back at all times. Others don’t like cluttering their waist with extraneous items and will go with a larger chest rig instead. That’s all fine. The principle is to get you dialed in a multilayered approach to equipment distribution to ensure you always have something from one of our primary survival needs categories on your person so long as you have your pants on! You might be thinking you won’t lose yours by any of the ways I mentioned above because you never take it off or let anyone sneak up on you. Ha, right! You’ll want to sit or sleep sometime, and no doubt the straps on your pack will eventually feel like they are going to bisect you no matter how ultralight your kit is. Realty is you may not get a vote in the matter at all. Simple accident or equipment failure may lead to loss of your pack as discussed earlier, anything from a busted strap or handle, leaving it laying when forced on the run, ditching it to minimize contamination risks, forced to hand it over at gun point, etc., etc. The list goes on. Heck, you may set it down in the dark and misplace it! Stress and fatigue can scramble even the sharpest brains. 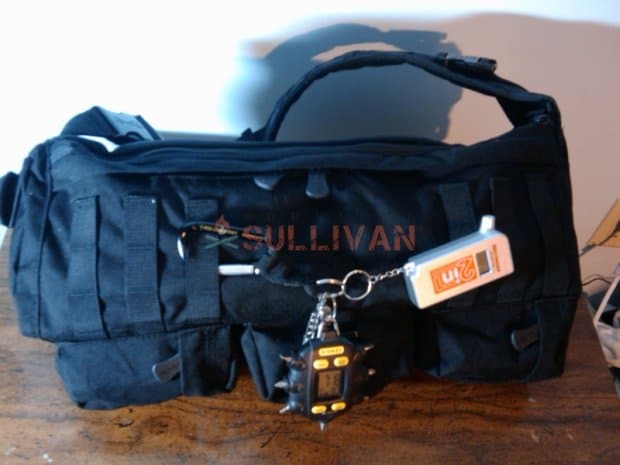 Your first step toward mitigating this scenario is simply ensuring your “Level 1” kit, the things on your belt and in your pockets is as comprehensive as possible. It is tough to lose something attached to your body in such a way unless you are forced to part with it. Second, you might consider a few methods to make your BOB easier to spot to prevent loss from chaos or mishap. Reversible marker panels are a good idea, as is tying a conspicuously colored cloth or bandana on to it. For dark conditions, a snap light with cover or pouch is a fair idea. A locking carabiner or sturdy strap can help prevent loss when moving by vehicle, or potentially securing your bag from being swept away or snatched, but it also means you will be slower to don it when required. If you are raising your hand preparing to cite me for security risk, hold that thought: it is up to you to weigh your threats against the risk of loss. For plenty, risk of simple loss may very well be a greater concern than overall concealment. If the opposite is the case for you, act accordingly. There is no way I could even pretend to anticipate what you’ll be facing even in a given crisis. Use your head. Whether or not you should take the time to hide primary or contingency resupply caches is a discussion all its own. If you do decide to lay in supplies either at your preselected destination or along your possible routes of egress you have a good chance of being able to replace or supplement your BOB and other carried gear in the event of loss, simply expending supplies, or being forced to leave hastily before you are able to pack and jock up. Your caches should be supplied in such a way that each is similar to your levels of carried gear; each one, big or small, is its own cross-section of the equipment and provision covering the needs of survival. So in the event you are starting with absolutely nothing except the clothes on your back (maybe not even that!) once you access a cache you’ll improve your situation across the board. A spare pack, even a small one, located with each cache can serve as a valuable backup, overflow luggage, or spare to hand off to a member of your group. The alternatives, either placing caches as dedicated hides of one type or category of gear may necessitate long travels to get needed supplies, or be impossible depending on prevailing conditions. This will also mean a destroyed, inaccessible or compromised site will not mean a total loss of one category of gear or provision. Deciding to cache gear is a personal choice and should only be undertaken in support of your strategic survival plans. Don’t go burying or hiding good gear around the countryside haphazardly, and remember you will need tools to dig them up! Loss of a BOB in a survival situation is a demoralizing blow to your state of readiness. It does not have to spell certain death, however. Through a combination of smart load placement, mindfulness of your bag and surroundings, and perhaps a few smartly hidden stashes of gear, you can prepare against the loss or theft of the item you chose to prepare you for the worst day of your life. It isn’t paranoia, it is simple redundancy, and redundancy saves lives. Being as though I am not a master bushcraft person I have a bob in the following places, one in both of my trucks, one in my motorhome, one in the house, and one on my bugout property and house property buried in a caches with lots of other equipment. I keep a pocket knife on me at all times, and credit card size fishing and misc. flat type tools in my wallet. I do seasonal equipment changes in all places except the caches. I live in Maine so we can see hot muggy summers and -30 winters with wind. I guess I am on my own if I loose it all. You simply cannot plan for each and every contingency. You plan, you prepare, you prioritize. But sad to say people will still die. As Billy Graham declared, One person out of every one will die.” Do your best and pray for God’s divine assistance. As leave the matter in His Hands. And that is truth – unless you have a BOB every where you go, you risk being left without it. So you make a 1st line EDC kit, something that fits in your clothing that takes of the bare necessities. Just in case you are left without it. My EDC wallet is one of those heavy trucker’s chained wallets. My coworkers refer to it as a pocket man purse, lol. But I keep a small SOG Crosscut multi-tool with sewing bobbin full of floral wire, a couple of needles, a credit card wrapped with duct tape / sewing thread. My key chain has two capsules, one with two days of daily personal meds, the other with two #6 fish hooks 10 iodine tablets. Wrapped around that is 20 feet of Spyderwire fishing line. At work desk, I keep a small ‘kit’ there. Peanut butter jar for makeshift canteen, containing a few other choice items. Leatherman multi-tool, a 55 gallon contractor’s bag. And a small water filter. Great article….I look at it this way…take it as a challenge to test your skills, what can you do quickly to fix the immediate issues(s). I too, carry a multi tool on me at all times, have one in the car and caches other places. there are “emergency” blankets in the car as well as heavier blankets. I am very fond of the 5 pocket pants I wore as an EMT, extra deep pockets can carry a bunch of little items to you get past losing a larger amount of gear. I have a small medical pouch(in the car) that attaches with a QD set up. small flashlight(s)batteries, and lighter(s) are also in this pouch. I’m impressed with the clear-headed realism of this short essay. Losing the BOB is definitely not a trivial concern given the level of chaos which must be assumed. I like the “cache” strategy”, but given how Murphy’s Law operates I think I’d keep the contents just as generic and “harmless-looking” as possible. In this age of easy DNA identification some ******* in Authority might see a chance to paint the cache-person as osama bin laden II if there was anything more dangerous than a pocket knife in the uncovered cache. Anything to win that next promotion. Or election. Terrific article. Agree that the brain is the most important tool, and more people should practice bare-hands survival skills- fire and shelter-making, trout tickling, stuff like that. Also appreciate comments that point out tools and gear can be in your wallet or keychain as another layer.